One of the most confusing dilemmas that prospective rhinoplasty patients face is choosing between endonasal and external rhinoplasty. These terms can be confusing, but they simply refer to the two most popular types of nose restructuring: open or closed. To decide which method is best suited for your needs it is important for you to speak with a professional surgeon about your options.The main difference between these two procedures is the placement of the incisions. 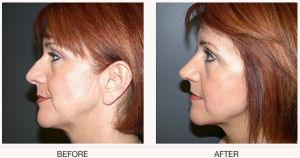 In a closed procedure all of the incisions are made inside the nostrils, so visible scarring is completely avoided. The drawback to this procedure is that repositioning of nasal skin must be done with limited visibility and the procedure can be more complicated for surgeons.With the open procedure, a small incision is made that provides surgeons visibility of the nasal structure, which leads to a more well aligned restructuring of the nose and its components. The drawback of the open rhinoplasty though is the chance of a small scar being visible.The healing process for both of these procedures is similar. Roughly a week of recovery time is required of both. The splints that are put in place to hold the nose’s new shape during each procedure are normally removed between 7 and 10 days after the operation. Bruising and initial swelling typically go down after 10-14 days. However, every individual is different, so recovery varies from patient to patient.If you are considering your options for repairing or reshaping your nose, consult with a doctor who will be able to advise you on which type of operation can safely meet your needs.